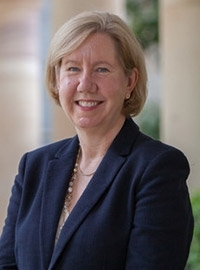 Professor Melissa Brown is the Executive Dean of the Faculty of Science at the University of Queensland. Melissa completed her PhD at The University of Melbourne in 1993, on blood cell growth factors and their role in human leukaemia. She then undertook postdoctoral training at the Imperial Cancer Research Fund and King’s College in London, where she was involved in characterizing the first breast cancer susceptibility gene. She returned to Australia in 1999, first to The University of Melbourne and subsequently to UQ where she has been since, with the exception of a 6 month sabbatical at The University of Oxford in 2005. During her career, Melissa has taught molecular genetics to thousands of students, has published over 90 research papers and reviews in the field of cancer genetics and has attracted more than $20M in research funding. In a number of academic leadership roles, including Head of School, Deputy or Acting Director of various Research centres, and Deputy Executive Dean and Associate Dean (Research), Melissa has also introduced multiple processes and schemes to enable research higher degree students and early career researchers to reach their potential, and to bring new teams of high calibre researchers together to address important questions in science and medicine, and has actively supported the career development of many UQ students and staff.